Has Fed interest rate policy lost its edge? You are at:Home»Money & Prices»Has Fed interest rate policy lost its edge? Investors should pay attention to the increasing influence of global financial markets on interest rates. These influences on interest rates will ultimately impact business and consumer activity. 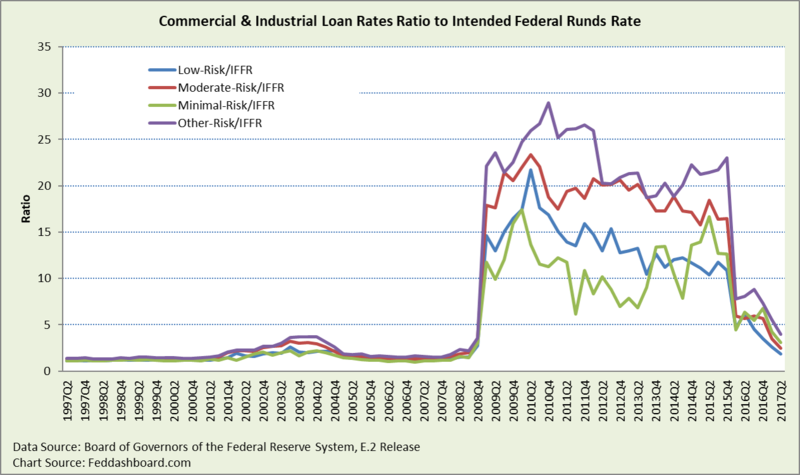 The Federal Open Market Committee (FOMC) expects their interest rate decisions to change the economy because they expect the Effective Federal Funds (EFF) rate implemented at a trading desk at the New York Federal Reserve Bank to consistently cascade across credit classes from Treasury Bills to business and consumer borrowing. Today, we look at how well other rates track the EFF. Treasury Bills are low-risk so they should track the EFF closely. 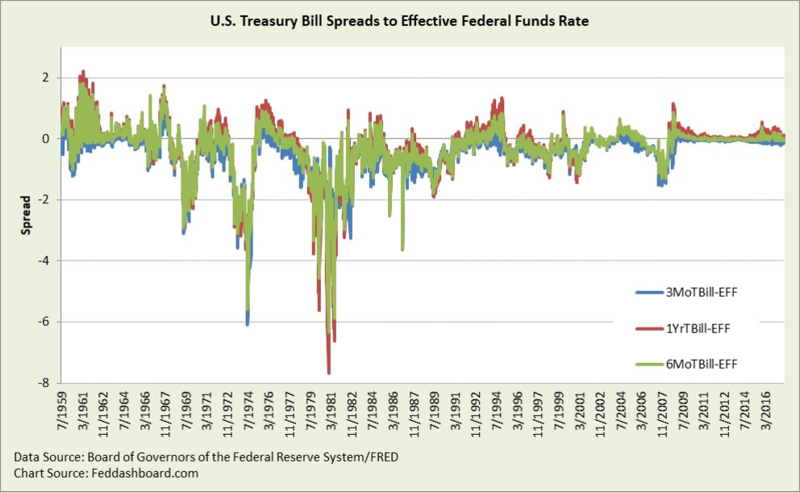 Let’s start by looking at spreads (T Bill minus EFF). 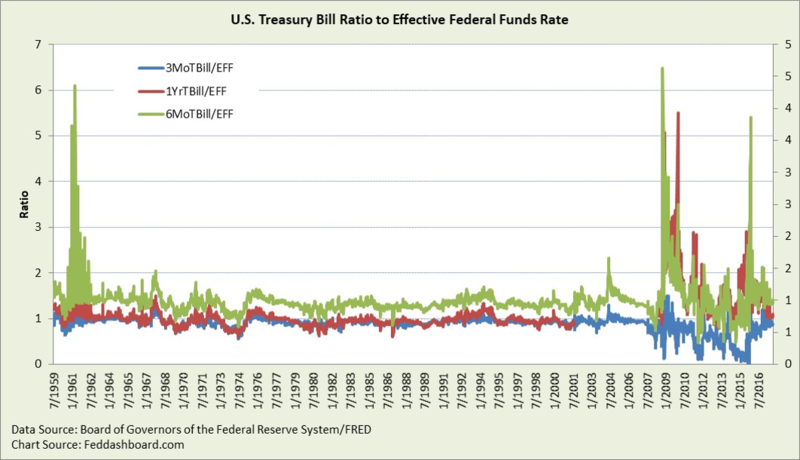 In reading the charts below, the flatter a line, the more closely a rate tracks the EFF. Higher spreads since 2015, compared with 2010-2014, have attracted much attention. But, today’s spreads are relatively small compared to the larger negative spreads in the run-ups to the mortgage bubble bursting and inflation spike of 1981, and following the oil crisis. The FOMC’s quantitative easing (QE) over-powered typical interest rate dynamics to reduce spreads. Now, that QE force has diminished. In the spreads view above, there are few periods of close tracking — early-mid 1960s, early-mid 2000s, and 2010-2014. Yet, spreads are not sufficient to evaluate the ability of the EFF to cascade because spreads are a fixed mark-up. More helpful is a proportional view of the EFF rippling through increasingly risky credit classes. The proportional view is the ratio of the T Bill divided by the EFF. Below, prominent is the original “Operation Twist” of 1961 (repeated in 2011-2012), the beginning of extraordinary monetary policy in late 2008, calming a bit, then picking up as interest rate speculation began in early 2015, and then calming considerably in 2017. Comparing the tracking between the spreads and ratios from 1964 to 2006, the standard deviation (relative to each mean) is over 10x greater for spreads. Switching to Treasury Bonds from Bills, the spike is only 3.35 for 20-year bonds in 1961 and 56 for 20-year bonds in 2011. But, government securities, with lower risk, are more relevant for corporate cash management and savers than for businesses borrowing to invest or consumers borrowing for “big ticket” durable goods. 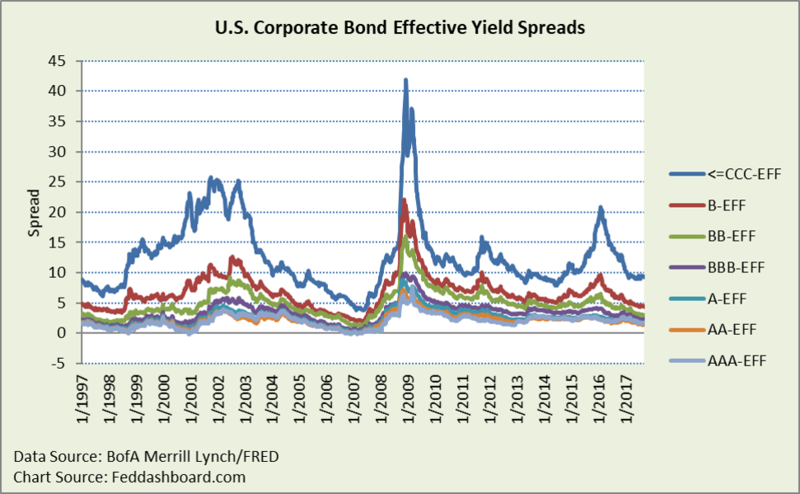 Corporate bonds have much greater spread divergence and trends (up and down) than Treasuries. The ratio view shows gigantic divergences with calming starting late 2015. The enormous magnitude of 2008–2016 visually hides big divergences in other years. 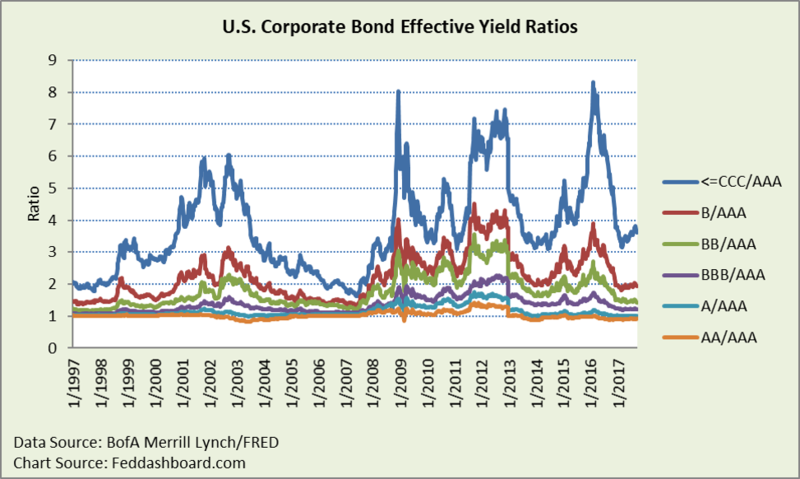 Because corporate bonds and the EFF have different duration, the view below shows all classes relative to the AAA rate. Above, interest rate increases are higher than proportional for lower credit classes. Differences illustrate how public markets have global dynamics far beyond the EFF, thus reducing the FOMC’s influence. 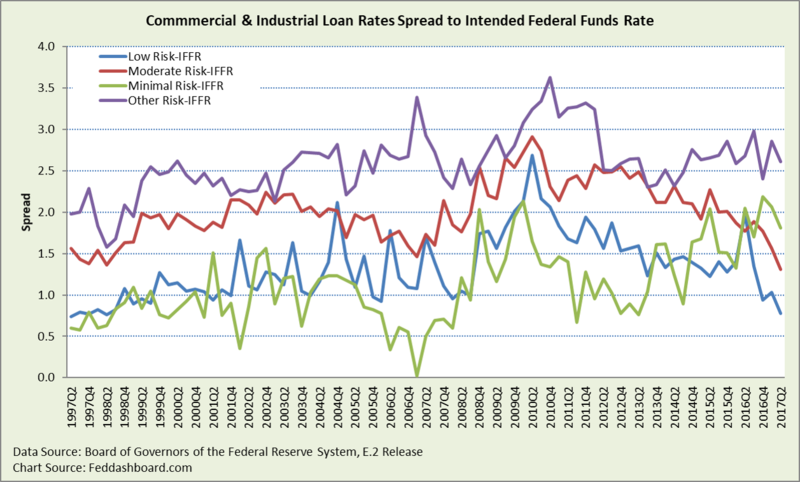 Bank loan rates to businesses seem more influenced by country regulation and the spread-driven bank business model. Below, the bank loan spreads view is closer to the ordinary understanding of relatively stable spreads. 2Q2017 was historically affordable for low and moderate risk borrowers, but expensive for minimal risk borrowers. The ratio view again shows borrowers didn’t fully receive the benefit of the lower EFF. For consumers, the transmission of the EFF will be muted because of change in mortgage composition. 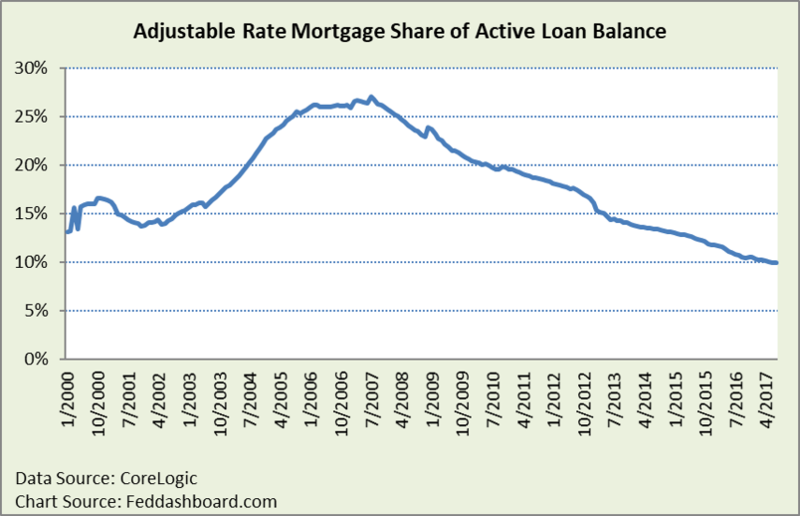 Sam Khater, Deputy Chief Economist at CoreLogic remarks that the Adjustable Rate Mortgage percent has fallen from about 27% in 2007 to about 10% today. The personal and auto loan spreads view offers more stability after the early-1990s, with decreasing spreads both during the easy credit period prior to the mortgage bubble bursting and since the 2009 spike. 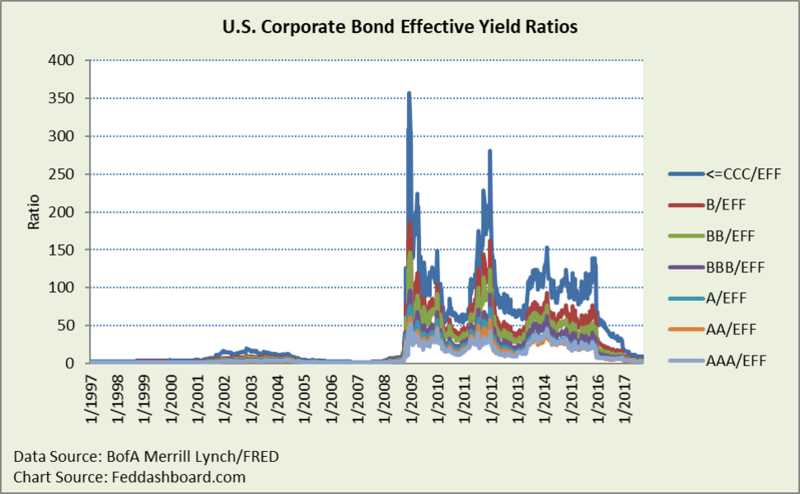 But the ripple view (not shown) looks more like corporate bonds with ratios up to 140. But, shifts in personal and auto loans also reflect longer duration than the EFF. 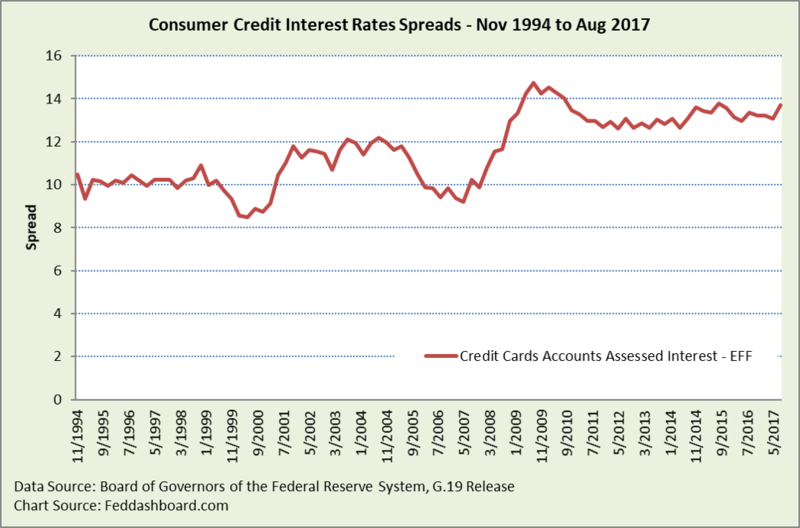 Credit card rate for accounts assessed interest has much shorter duration and is closest to a flat line. Spreads step-increased after the mortgage bubble burst and have a slight up-trend. The spread view is still a fixed mark-up. The ratio view (not shown) rocketed to a high of 180 from a pre-crash 3 – a lower EFF didn’t fully ripple to consumers.